A squad of 28 swimmers, supported by Ian Blyth, Iain Phillips and Mark Simms, attended our first gala at Windsor on 2nd/3rd December. 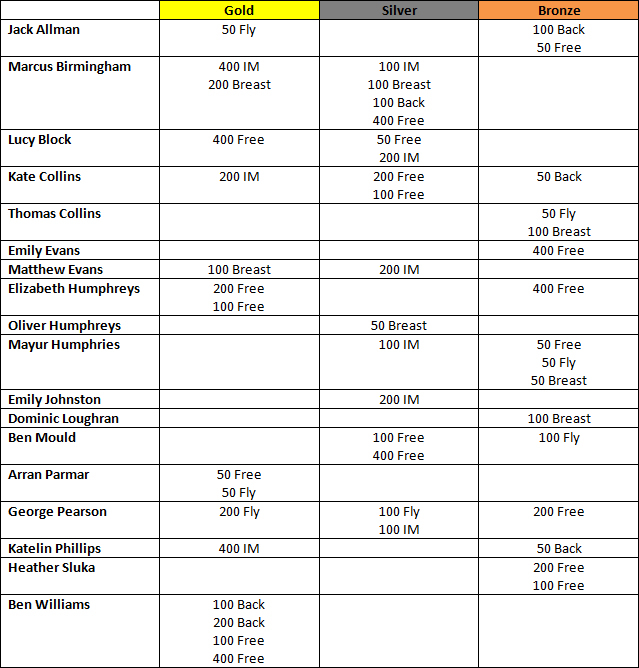 This was a last opportunity to get times for County qualification and as you can see, many PB’s were swum and medals won. Well done to all those who took part, especially those who had mock exams the very next day, great commitment! Wishing everyone a restful few gala free weekends over Christmas before the excitement begins again in January for those who have qualified for County (fingers crossed for those with consideration times), good luck everyone and have a great Christmas! 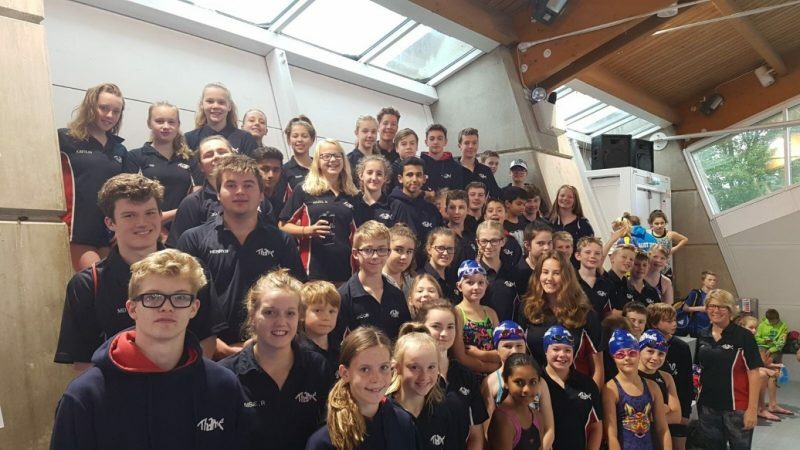 Only one week after celebrating a brilliant Club Champs, a team of 29 swimmers gave their very all once again at the Watford level 3 County Chaser meet. Being the penultimate weekend before the county qualifying period closes the level of competition was fierce and fast! However, this did not put off our swimmers who as always gave their very best in every race showing great camaraderie and friendship along the way. It was brilliant to see the team having a lot of fun, but giving their absolute all in the pool. Between swims during warm up the girls enjoyed some dancing (think Macarena and YMCA) as well as a sing along to the Christmas songs! Amelie even donned her ‘It’s Christmas’ hat for warm up. Brilliant fun as always even if a little early for Christmas maybe!! As for the swimming, after a few technical difficulties we got the gala under way, the girls kicked off the day in the 400m Freestyle event. Ella and Tally (both picking up bronze medals) and Lizzie (silver medal) all swimming a great race, as well as Amalie who knocked 3 second off her PB. Rory was our sole representative in the boys 400 freestyle, finishing in 4th spot in his age group. The races came thick and fast from here on in with a number of swimmers chasing and achieving county consideration times as well as lots of PB’s and medals! In the 100 Breast Amelie, Lucy Block, Tabitha, Abi and Katelin all got PB’s and Kenzie picking up a Gold Medal. The Boys followed with Murray, Rory, Joshua Greig and Harry all getting PB’s – Murray and Sam White picked up Bronze and Gold medals respectively. In the 100 IM Tabitha, Sacha and Maya swimming PB’s with Kenzie picking up the gold medal. For the boys Murray and Sam White both swam PB’s with Murray picking up the Bronze medal. This was followed by the 200 Back where both Abi and Hazel swam PB’s with Abi picking up the Gold medal and Lucy D the Silver medal in their age groups. For the boys event Louis Bolton also PB’d in the 200 Back. Amelie, Lucy Block, Tabitha, Abi, Sacha and Katelin all swam PB’s in the 100 Free with both Kenzie and Abi picking up a Bronze medal. Joshua Boddy and Murray also swam PB’s in the 100 Free with Murray gaining a gold medal. Amelie swam a PB in the 200 IM, with Murray claiming a Silver medal in this event, this was followed by the 50 Fly where Abi, Sacha and Hazel all swam PB’s, Lizzie (Silver) and Kenzie (Bronze) also picking up medals. In the boy’s event Sam White, Murray, Rory, Ben M, Joshua Boddy and Jack Allman all swam well to get PB’s with Jack and Murray getting the Bronze medals for their respective age groups. In the 100 back Murray, Joshua Boddy and Jack Allman all swam PB’s followed by the girls where Lucy Block, Maya, Abi, Flora and Katelin also got PB’s and Lucy B picking up gold for her age group. This was followed by the 200 Breast where Sam White and Abi both swam PB’s with Sam picking up a silver medal. Murray PB’d in the 100 Fly picking up the Silver Medal with Lizzie also picking up the Gold Medal and Lucy B and Lucy D both getting PB’s. Joshua Boddy (Gold) and Sam White (Silver) both picked up medals and swam PB’s in the 50 Breast, Katelin also PB’d in this event. In the 200 Free Sam White swam a PB picking up a gold medal followed by Katelin, Flora, Abi, Emily E, Lucy B and Lucy B all swimming PB’s and with Abi and Lizzie both getting Silver Medals in their respective age groups. Jack Allman, Joshua Boddy, Joshua Greig and Ben M all swam a PB in the 50 Back. Hazel, Katelin and Flora all joined them in also swimming PB’s with Abi getting Bronze and Kenzie getting the Silver medal for their age groups. 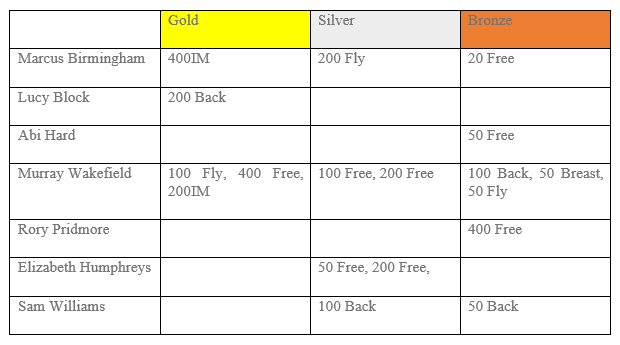 The penultimate event was the 200 Fly where Murray PB’d and got a Gold medal. In the 50 Free Sam White, Murray, Arran, Ben M and Joshua Boddy all swam PB’s. Martha, Emily and Flora all swam PB’s as well with Abi getting a Bronze medal and Lizzie the Silver and Kenzie the Bronze in their age groups. Our thanks as always to Emma Camp, Wendy Randall and Rachael Humphreys for helping to officiate at the gala. Also to Geraldine Dodds for team managing, Ian Blyth, Mark Simms and Iain Phillips for coaching. Next week we head to Maidenhead for the final gala in 2017. Good luck team! Thame was once again swimming at the Southeast Winter Championships at Portsmouth at the weekend 4th/5th November. 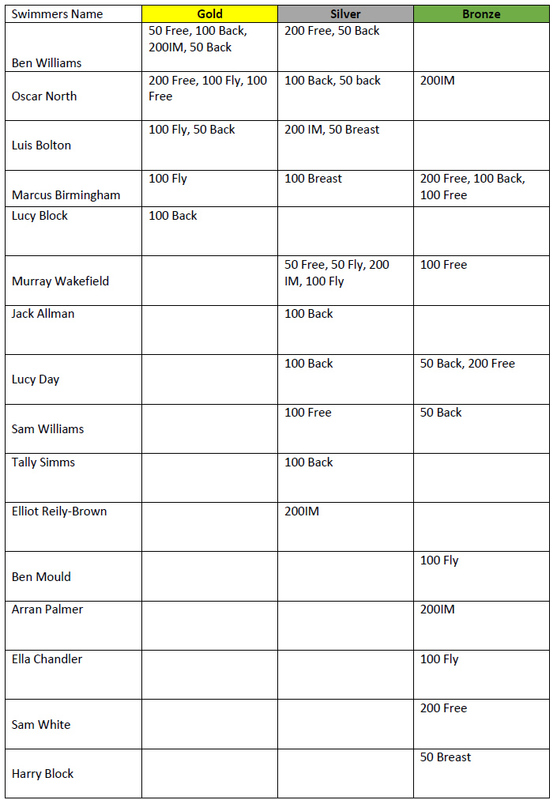 Taking part for Thame was Marcus Birmingham in the100 fly, 200 fly, and 200IM and Lucy Block in the 200 backstroke. This was in a very high standard swim meet for this time of the year so just to get into the meet was a great achievement in itself. Marcus and Lucy did themselves and Thame proud. Marcus coming 11th in the 200 fly and 25th in both the 200 IM and 100fly. Lucy being the youngest swimmer at the meet only 13 came 34th in the ladies open and 26th in the Juniors. 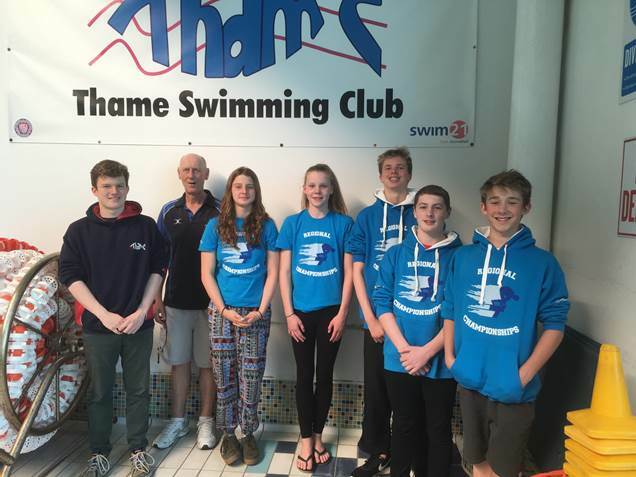 Over the weekend of the 7th/8th October, Thame swimmers attended the Maxwell meet. 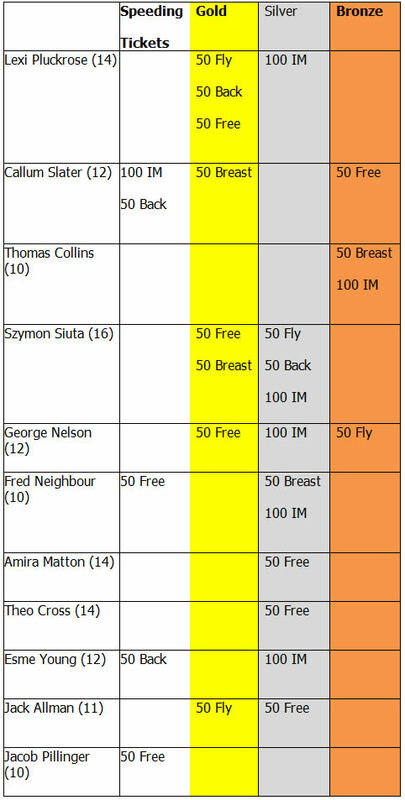 The meet had been heavily oversubscribed with close to 6000 swims entered, 60% of these having to be scratched. Sadly this included some of our disappointed swimmers. With Head Coach Ian Blyth, supported over the weekend with Annie and Mark, the team were as keen as ever to race. Saturday got under way with Marcus Birmingham putting in a great swim in his 400 IM gaining a gold medal, followed by Lucy Block taking an impressive 9 seconds off her PB in the girls 400 free. The girls 100 free was next with Abi Hard getting a PB and Elizabeth just outside hers, both girls just missing out on 3rd place in their age groups. In the Boys 100 Breast Dominic Loughran and Sam White both achieved PB’s. Emily Evans put in a good performance to take over 4 seconds off her best time in the 200 IM with Lucy Block swimming on her PB. Marcus took the silver medal with a PB in the 200 Fly followed by Abi who slightly improved her 50 Back time. Next were the 11 year old boys in the 50 free with Joshua Boddy, George Pearson and Dominic all swimming PB’s. In the 100 Fly Murray Wakefield stormed to Gold for his age group taking over 4 seconds off his time which was only achieved at BBAT. Elizabeth Humphreys matched her PB in 50 fly just being pushed into 4th place. In the 50 Breast Murray and Sam White both swam inside their best times with Murray earning a bronze medal before taking 5 seconds off his 200 Free to win silver in his next event. Marcus and Rory Pridmore then went head to head in the Boys 200 free finishing with less than a second between them. Marcus taking the bronze medal and Rory 5th place. On Sunday morning it was a quick start into the medals again as Murray took gold in the 400 free with an amazing 8 second PB and Rory taking bronze in his age group. Lucy Block took the next medal with Gold in the 200 backstroke with both her and Abi swimming on their PB’s. Lucy Day swam 2 seconds faster than her PB with Elizabeth just missing a medal spot again! The 11 year old boys Joshua, Jack, Benjamin and George were up again next in the 100 free with all of them getting PB’s and Murray claiming a Silver medal. Murray again took gold in the 200IM with an impressive 4 second PB. Sam Williams, our youngest swimmer competing this weekend took bronze in the 50 back with a 2 second PB with Joshua also taking a second of his PB. The Thame girls were up next with Lucy D, Abi and Lucy B all competing in the same heat of the 50 free. Abi took Bronze going sub 30 for the first time with both Lucy B and Lucy D also getting PB’s. Elizabeth took silver for her age group with a PB and Kenzie-Leigh Orkney achieving her goal of going sub 30 after returning from injury. Sam Williams hit the medals again taking silver with a 5 second PB in his 100 back and Murray sharing Bronze in his age group with a 2 second PB. In the 50 Fly Benjamin Mould, Jack and Murray all swam PB’s, Murray earning himself another bronze medal while Sam White narrowly missed out on a medal in the 200 breast taking 4th place. The last event of the meet was the girls 200 free with Elizabeth taking silver for her age group and Lucy Block also swimming insider her best time. Well done to all the swimmers this weekend there were a number of County Accepted and considered times achieved. The support shown at the end of the lane and also on the finish line for all the swimmers during the events was fantastic as always. What a fabulous team! Hot off the heels from BBATT a small but determined group of Thame swimmers headed off to Bletchley for the Modernian Swimming Club Gala at Bletchley Leisure Centre. It should be noted that this was a Level 2 gala, and therefore a step up in standard, entry alone is tough, as well as the competition! This was the first level 2 gala for many of our swimmers, so a very well done to all though who competed. In total Thame were represented by 16 competitors over the two days, these were; Abigail Hard, Lizzie Humphreys, Ella Simms, Esme Young, Harry Block, Jack Allman, Jacob Pillinger, Josh Boddy, Katelin Phillips, Kenzie-leigh Orkney, Lucy Block, Lucy Day, Marcus Birmingham, Maya Camp, Murray Wakefield and Sam White. Tally Simms had also been accepted but due to appendicitis was unable to compete. We all wish Tally a speedy recovery and hope to see her back in the pool very soon. The competition was tough, but that didn’t stop our team giving it their all with a good number of personal best swims across all groups. The medal table is below. In total the team picked up 16 medals which is a great achievement at this level! 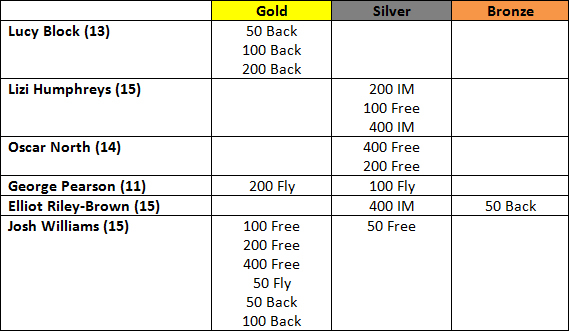 Here are a couple of highlights from the weekend, and we look forward to another full weekend of swimming next week at the Maxwell meet in Aylesbury. Lucy Block, not only the fastest 200m Backstroke swim at the gala (across all age groups), but a two second PB swim that puts Lucy in the top 20 in her age group in GB!! That’s just brilliant, well done Lucy. Sam White with a Gold winning 400m Freestyle swim, taking 13 seconds off his entry time and gaining a county accepted time as well. Sam picked up 6 medals in total and was our most successful swimmer over the weekend. Well done Sam! Murray Wakefield, taking 3 seconds off his BBATT 100m Freestyle and ticking the county considered box in this event. WOW, what a great start to the season for Thame Swimming Club! This year a record 91 swimmers from TSC entered BBATT, all keen to get the season off to a good start! It’s great to see so many of our swimmers getting involved, great job team! Officials, Michele Block, Emma Camp, Emma Day, Marc Furlonger, Sue Hewett, Rachel Humphreys, Hugh Nelson, Wendy Randall and Phil Evans (a special congratulations and thank you to Hugh Nelson also passing his J1 official qualification this weekend). As for the swimming, where do I start!! With so many swimmers and 559 single entries it is impossible to call out everyone I’m afraid. I will let the medal table do the talking this time (see below), and highlight a few things that stood out. I am sorry for missing anyone out, there are many swimmers in the squad who showed great commitment and taking part in a gala of this size is an achievement in itself, so a massive well done to every swimmer. Thame Girls ‘Haka’ – First thing on Saturday morning the Thame Girls went about their mobility routine pre-warmup. Limited with space the girls lined up below the spectator stands taking up the whole length of the pool. With 40 of them lined up, led by Ella Simms and Maisie Randall it was quite a sight, and I’m quite sure the competition took note that the Thame girls meant business, particularly at the end with the signature, 1-2-3 Thame team chant!! We had a number of our youngest swimmers enter their very first gala this weekend. At such a big event this was daunting for them, but every one of them did brilliantly. 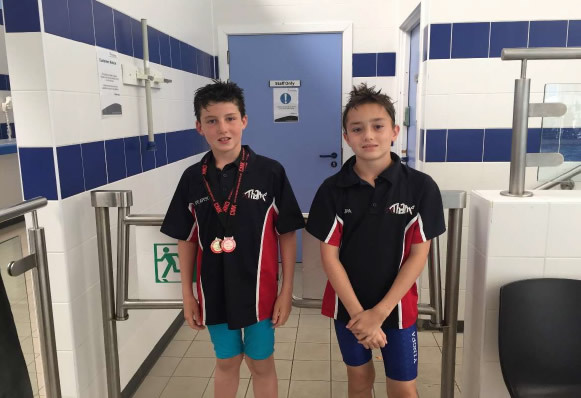 Our youngest swimmers were Zachary Young and Finn Soutar both only 8 years old, who also brilliantly picked up medals, with Finn winning Gold in the 100m Freestyle and Zachary Bronze in the 50m Breast, well done boys! 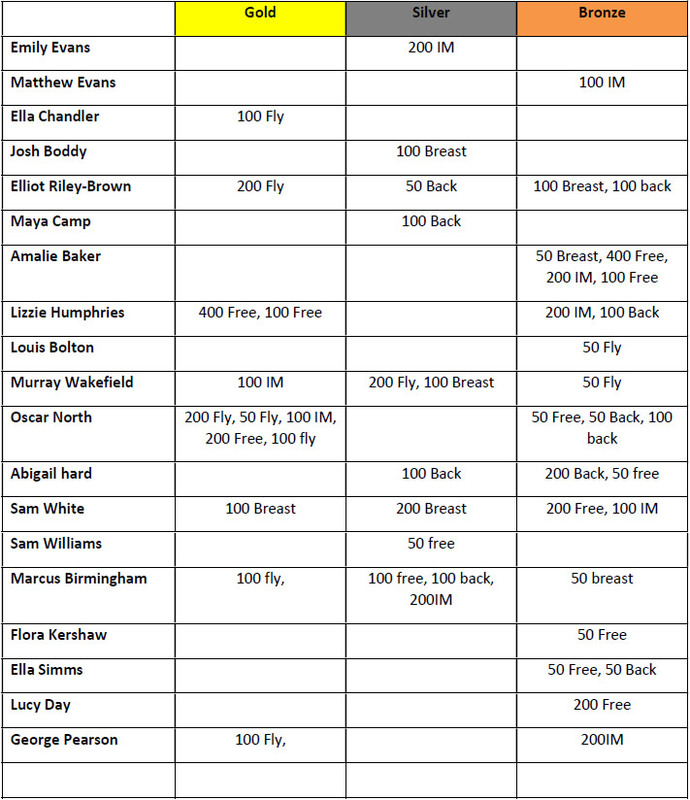 Many congratulations also to Noah Blayney, Alessandra Charlton, Sam Morley, Holly North, Hywel Scott, Jessica Tansley and Ellison Socrates, all swimming at their first gala too. We look forward to seeing you all at the next gala and club champs, we hope you enjoyed the weekend. The loudest cheer of the whole weekend was reserved for Ellison Socrates – Not only was this Ellison’s first gala, he also braved the 200m Fly (a race not many dare to enter, at any age)! It is fair to say this event is not for the faint hearted but Ellison gave it all he had. In the first heat with only 3 young swimmers the whole crowd of spectators, and swimmers from all clubs got behind him to see him through to the finish. The roar was deafening with everyone (at least 300 people cheering him on). A massive well done to Ellison for taking it on, this was a standout moment of the weekend! Girls 400 Freestyle; Tally Simms knocking 16 seconds off her PB, Lucy Day swimming under 5 minutes for the first time, Abigail Hard, winning gold and taking 20 seconds off her best time! Boys 50m Freestyle; Josh Boddy and Jack Allman in a dead heat joint gold medal place, both in under 35 seconds and securing a county considered times! Arran Parmar and Rory Pridmore both achieving great PB’s. Boys 200m Backstroke; George Nelson swimming this race for the first time. Josh Greig taking gold and knocking 10 seconds off his best time. Girls 200m IM; Katelin Phillips with an impressive 10 seconds off her PB and under 3 minutes for the first time! Boys 100m Fly; Jack Allman taking this on for the first time and winning gold. Girls Backstroke; Lucy Block with impressive PBs in all backstroke races, particularly in the 200m being the fastest girl of the day in all age groups. Not bad for 13 years old, brilliant Lucy as always!! Boys 200m Freestyle; Louis Bolton, a 10 second PB and a gold medal, impressive! Girls 200m Fly; Maya Camp, first time entry to 200m Fly, and a bronze medal, go Maya! Boys 50m Back; Fred Neighbour, under 50 seconds for the first time and a 4 second PB. Girls 50m Fly; Big well done to Eleanor Weeks-Pearson, Esme Young, Evie Galloway and Sian Carrington for taking this race on for the first time, a tough race but you all did brilliantly! Girls 400m IM; Lucy Day and Hazel Randall for impressive 400m IM Swims! Boy 400m Free; George Pearson and Jack Allman in a great race with less than a second between them at the finish. Callum Slater swimming the race for the first time, well done boys! Girls 50m Free; Holly North in her first gala at 9 years old, picking up a silver medal too, well done Holly J. Jessica Tansley also for the first time in this race too. Boys 200m IM; Sam White and Murray Wakefield in a great race with only 0.05 seconds splitting them at the finish and also picking up gold and silver medals. First time 200IM swims for Ellison, Josh, Jack, Benjamin, Callum, Mayur, Henry, Matthew, Jake, Jacob and Joseph, brilliant! Girls 200m; Free; Emily Evans, a 19 second PB, Emily neighbour swimming for the first time, Ella Simms with a 7 second PB! Girls 100m Breaststroke; Alessandra Charlton, Eleanor Weeks-Pearson, Esme Shipley, Jasmine Grimes all swimming for the first time. Boys 100m Free; Finn and his gold medal! Josh Boddy taking 9 seconds out of his best! 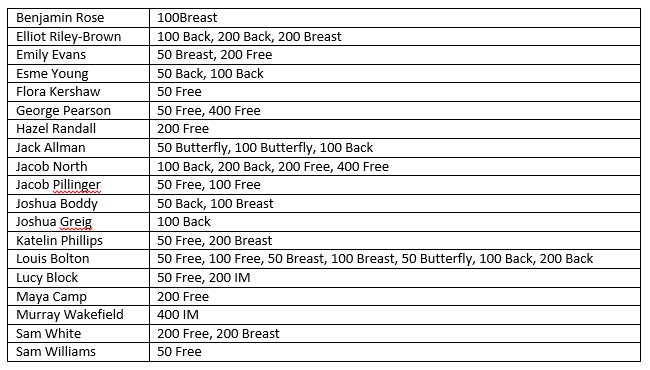 Girls 100m IM; Big well done to all the younger girls entering the tricky 100m IM with 13 swimmers in the 12 and under age group taking this on! Once again, sorry to have missed people, everyone did so well. We look forward to the next gala and seeing loads of our swimmers at the Club Championships in November! I will leave you with the team photo and medal table. *BBATT (Bourne End, Didcot Barramundi, Aylesbury, Thame and Tring). On Sunday 3rd September 2017, Thame Swimming Club held its 4th Annual Aquathlon event. Despite the persistent drizzle, 44 Club Members took part in this fun but challenging event and what a fantastic way to kick off the new swimming season! – 9-12 year olds who swam 400m and then ran 1k. – 13+ year olds who swam 800m and then ran 2k. Everyone taking part in the Aquathlon really gave it their all; with some of the younger competitors never having swum a 400m event. Well done to each and every one of you, we are very proud of you all! All competitors received a well deserved Thame Aquathlon ‘finishers’ medal at the line. The full results and timing breakdowns are shown in the attached excel document for those of you who want to see how well you did in each element. Well done to all the age group winners and to Tally Simms and Murray Wakefield (U12) and Lizi Humphreys and Marcus Birmingham (13+) for being the overall age group winners. Despite the miserable weather there was a fantastic atmosphere amongst all the competitors and the supporters so a massive thank you to all the parents, siblings, grandparents and friends who came to cheer everyone on. Also a huge thank you to all the volunteers who stepped forward and helped with lap-counting, timekeeping, computing and marshalling – we really couldn’t do it without you, and finally a special thank you to Simon Haarburger for orchestrating the whole event. Further thanks go to Corinne Baker and Wendy Randall for organising such a scrumptious cake sale, which raised much needed funds for the Club – thank you also to everyone who baked and brought along such lovely cakes and biscuits! Attached are a few photos from the Aquathlon taken by James Newton, our wonderful ‘official’ photographer for the day – thank you James for doing such a brilliant job. Please follow this link to find the rest of James’ photos, https://www.dropbox.com/sh/46hlv48letx2b99/AABtNS2iBdrFnbZkV9P7DPtya?dl=0 Please remember these photos are for TSC Club Members only and should not be published on social media, unless the pictures are solely of you, or you have permission from those in the picture. I hope everyone has had a wonderful summer and here’s to a successful swimming season ahead, kicking off with BBATT next weekend – 16th/17th September. We have our biggest squad yet going to BBATT, so let’s see if we can bring home that Top Club Trophy! 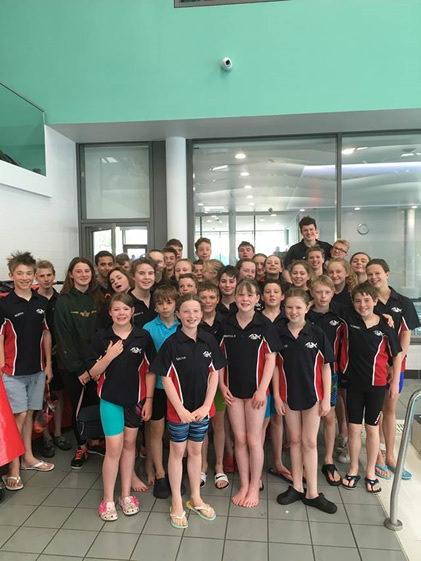 On Saturday, 32 of Thame’s finest swimmers attended the Bishop’s Stortford end of season meet. On this occasion, the boys outnumbering the girls 17 to 15! Coached by Ian Blyth, assisted by Damian Wakefield and managed by Helen Birmingham the team were raring to go. Special thanks also to Michelle Block and Phil Evans for representing the club and helping to officiate. Today, Ben Williams signed off as Club Captain in his last gala for the club. Leading by example Ben was immense in the pool showing the squad how it was done, picking up 4 golds and 2 silver medals along the way. The loudest cheer of the day was saved for the final heat and Ben’s final race for the club. We wish Ben all the best at university. With the team in great spirits, and with the luxury of one of the best pools in the area the squad got to work in the Girls 200IM, with 10 of the 15 girls entered. There were notable long course PB’s on show with Emily Evans, Hazel Randall and Abigail Hard all surpassing their best. PB’s of particular note were Tally Simms swimming sub 3 minutes for the first time and Luck Block taking 5 seconds off her best. The boys kicked off with the 200m Freestyle, with a super PB for Ben Mould, as well as Murray Wakefield (Silver), Sam White, Oscar North (Bronze) and Captain Ben Williams (Gold). Our younger squad members kicked off their day with the Girls 50m Backstroke. All achieving great PB’s were Emily Neighbour, Louise Birmingham, Jess Chandler, Isabel Day and Martha Block – well done girls! Following the girls, we had the Boys 50m Freestyle. Sam Williams keen as ever swimming a great race alongside Ruben Humphries both taking 6 seconds of their best times. Fred Neighbour swam a great PB next taking 3 seconds off his best time and swimming under 40 seconds for the first time. Special mentions go to Jack Allman who swam beautifully coming in under 35 seconds, Arran Parmar swimming a 28.12 and Ben Williams (Gold) with a PB and a 26.22 second race! Tackling the Girls 100m Freestyle Martha, Louise, Isabel and Jess once again all swam PB’s as well as Tally Simms taking 2 seconds off her best time! Abigail Hard also close to a 2 second PB. Bringing the morning session to an end were the boys with the 100m Backstroke. Jacob North swam an amazing 10 second PB, along with Jack Allman (Silver), Ben Mould (Bronze) and Oscar North (Silver) all with PB’s too! As the day came to a close and with the North brothers counting their winnings (picking up 3 spot prizes throughout the day), the team packed up, collected their medals and headed off home for some well-deserved rest! Another gala under our belts, well done team Thame! 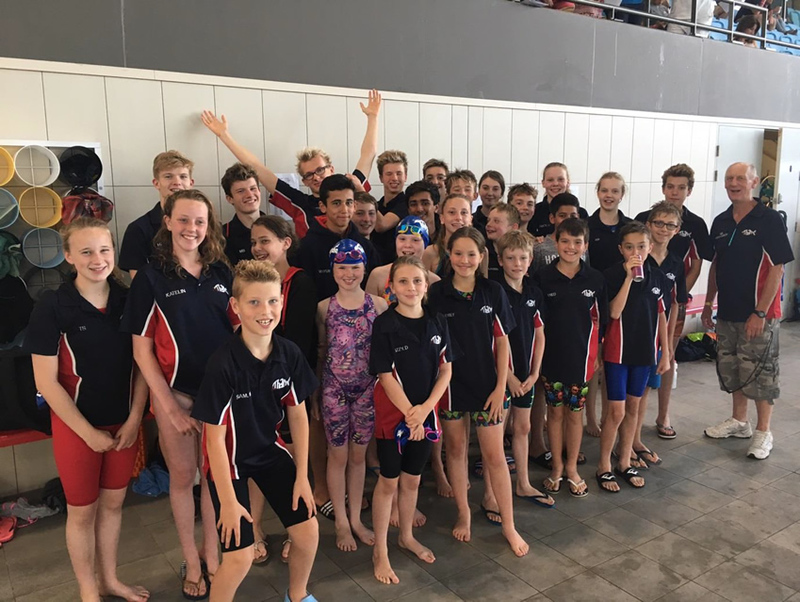 Over the weekend of the 17/18th June, Thame headed off to Bletchley for CMK summer open meet, and what a hot, hot weekend it was in and out of the pool, with Thame Swimming club on sizzling form once again. Isabel Day – 50m fly, first time under 50 secs – great job! Jack Allman and Jacob North for both swimming 1:18:12/1:18:26 for their 100m freestyle- great to watch! Katelin Phillips – 200m freestyle – 19 secs off entry time. Well done! Tally Simms – 200m Freestyle – a massive 19 secs PB. Way to go! The younger team in particular were as keen as ever. We welcomed Sam Williams for his first gala. Sam (9 years old) was a great addition to the team in the afternoon, cheering on his team mates in every race and picking up a silver medal along the way, well done Sam! A future Thame superstar maybe? After an early start the day kicked off with the girls 400m Freestyle. Emily Evans, Hazel Randall, Katie Livingstone and Amalie Baker all swimming personal bests with Lizzie Humphries picking up a gold medal. Throughout the days we saw many PB’s and medals being picked up and everyone did a great job. Emily Evans – Swimming her first 200IM with an amazing 2:57.99 time! 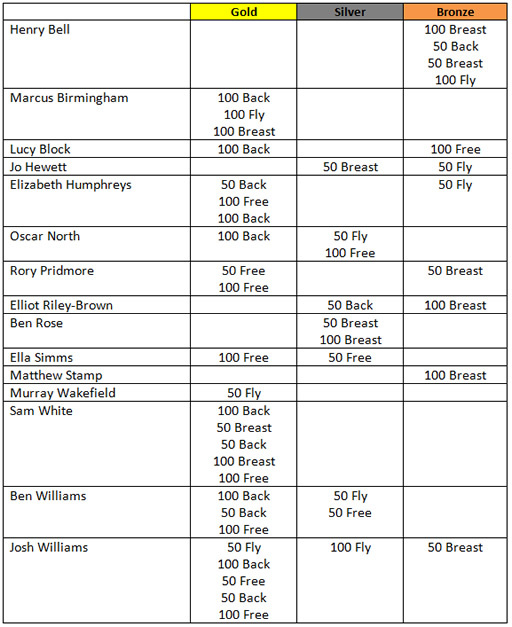 Marcus Birmingham and Lizzie Humphries were selected for the boys and girls Skins competition (as one of the 8 fastest 200m IM swimmers). Both were selected to swim in lane 8 against tough competition, Marcus’s first swim pulled out of the hat was backstroke, great performance and he eased into the next round, next up breaststroke, this was a tough heat and Marcus respectfully came 6th, well done Marcus, a great performance. Lizzie was 5th in the 50 Freestyle making it to the second round. With 2 swimmers eliminated and Fly selected as the second race Lizzie just missed out by a small margin coming a respectable 5th place. Well done Lizzie. Well done to everyone. Regardless of medals and PBs you all did a great job! On Sunday Team Thame enjoyed a great afternoon and evening of sprint racing at the Witney & District Swimming Club Invitational Development Meet. An enthusiastic squad of some 28 swimmers from TSC Groups 1 and 2 attended this gala competing against four other clubs from the County. The girls flew out in their first event, the 50 fly, with 5+ second PBs for the following swimmers Isabel Day, Alex Smith, Emily Neighbour, Amira Matton, Emily Vaughan, Esme Shipley, and Amy Furlonger – well done girls! The boys soon followed suit with fantastic swims in the 50 Breaststroke – Louis Withers managed to shave an amazing 16 seconds off his time (wow), whilst Callum Slater got a 6 second PB to win Gold in the 11-12 Age Group! Esme Young was awarded a speeding ticket in the 50 Back, whilst Fred Neighbour and Jacob Pillinger each picked one up in the boys 50 Free. Very impressive swimming by both boys but special mention must go to Jacob as this was his first gala – what a start!! A big shout out goes to Sian Carrington who clocked up some very competitive times at what was also her first gala. Szymon Siuta broke under 40 seconds for the first time in his 50 back to get a silver medal in the 15 & over age group. Congrats to George, Jack and Callum, who cleaned up in the boys 50 Free picking up Gold, Silver and Bronze, all with great PBs. Thomas Collins and Fred Neighbour swam side by side in an exciting 50 Breaststroke, wth Fred just pipping Thomas to the wall, to win silver with Thomas picking up Bronze. and George Nelson managed an incredible 11 second PB on his 100 IM getting him a silver. I wish I could mention each and every swimmers’ achievements as they gave their all but sadly there are too many; so huge congratulations to the whole team, not only on your performances but also on being such a lovely bunch to look after and for cheering your team mates on! 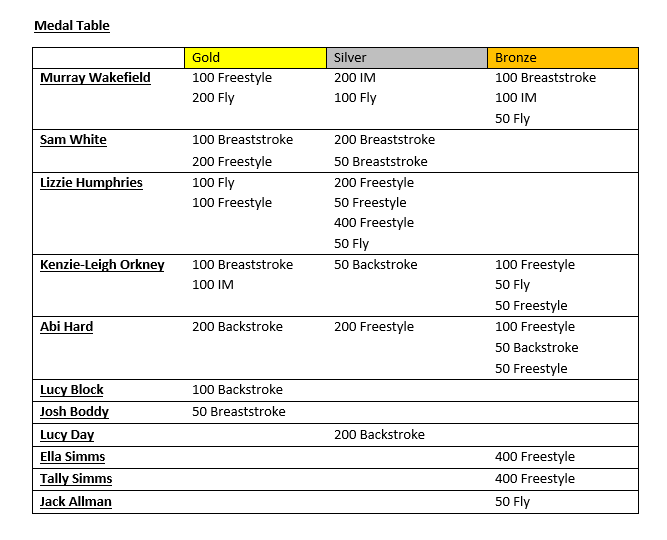 Below is our medal tally from Witney (the age groups were 9/10 year, 11/12 years, 13/14 years and 15 & over) – pretty impressive! A big thank you to our ever supportive coaches Ian Blyth and Lucy North and your Team Managers for this event were Helen Birmingham and Michele Block. Thanks also to Rachel Humphries and Emma Day for Officiating at this meet. 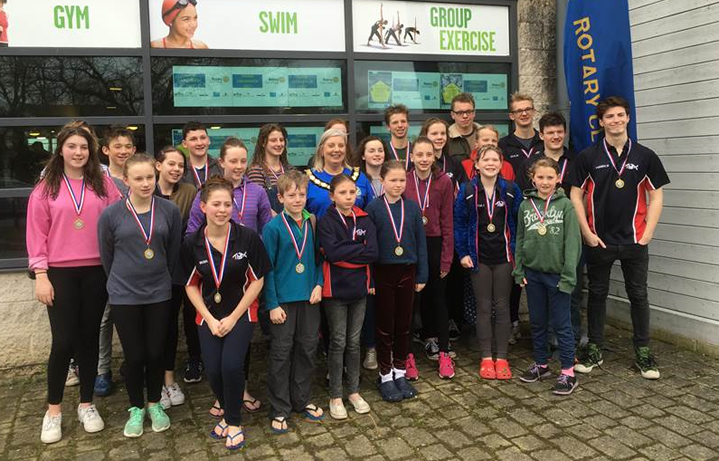 Fantastic swimming was in evidence across the whole of the Swim England South East Regional Championships across May 2017 – so a massive congratulations to all the Thame Swimming Club swimmers. 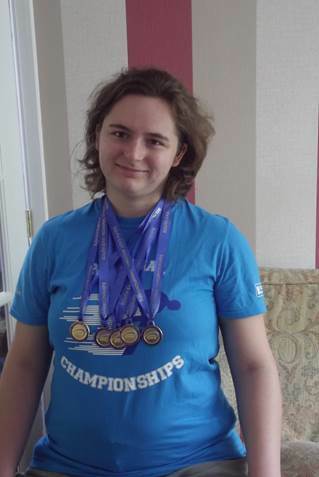 Jo Hewett was queen of the pool winning a fantastic 5 Gold medals out of her 5 races: 100 Free; 100 Breaststroke; 50 Free; 100 Back and 200 Free. Marcus Birmingham swam up a storm in his 200 Fly to reach the final and PB’d with a fantastic time of 2.19.67. Marcus also came 7th in the region for his 400 IM and was reserve for the 200m Breaststroke final. 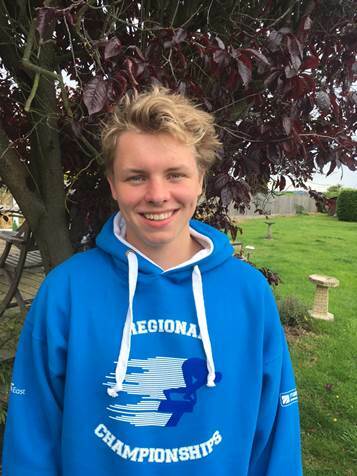 Rory Pridmore was swimming for the first ever time at the Regional Championships and secured great times for his 200m Free and 400m Free races – no mean feat given it was also the first time Rory had swum these events long course. Elizabeth Humphreys swam strongly in her 50 Free race to gain a great PB of 29.52. Elliot Riley-Brown achieved a fabulous PB in his 50 Backstroke with a time of 31.43. Josh Williams, whilst swimming for Wycombe still has dual registration with Thame so it feels only right to mention his achievements. Josh won Gold in his 400 Free and is currently 18th in GB for his achievement. He also won Gold in the 4 x 200 Free relay; Silver in the 4 x 100 Medley relay; Bronze in the 1500m (with a 52 second PB), 200 Free and 100 Free events and reached the finals for 100 Back and 50 Back. Thank you to Sue Hewett for officiating at this meet. Lucy Block was absolutely on fire qualifying for 3 finals out of 3 races – no mean feat. Lucy achieved 4th and 5th place in the finals for the 200 Back and 100 Back finals and 6th in the 50 Back, taking a massive 4 seconds off her previous PB. Awesome swimming. Oscar North was also swimming at Regionals for the first time and swam strongly with great times in his 200 Free, 200 Back and 400 Free – all of which Oscar was swimming Long Course for the first time. Well done. Thank you to Head Coach Ian Blyth who supported each and every swimmer across the whole of the Championships. 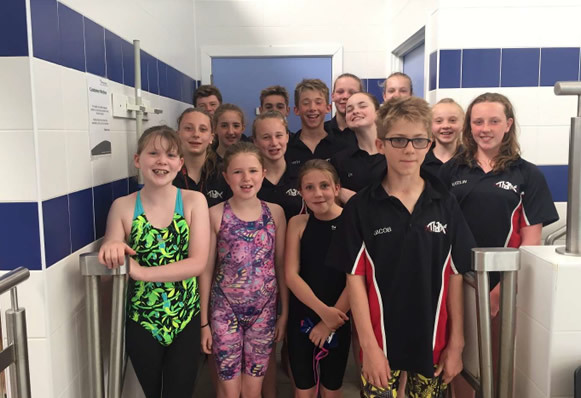 A team of 39 Swimmers representing Thame Swimming Club descended upon Bletchley Leisure Centre for the Leighton Buzzard Open Meet on Sunday 14th May. Coached by Mark Simms and Lucy North along with first time team managers Damian Wakefield and Helen Birmingham a total of 63 Medals and 21 Speeding tickets were amassed! Special thank you to Phil Evans, Rachel Humphreys, Rachel Mould, Wendy Randall and Emma Camp for representing the club and officiating what was a very well run event. The boys began their day with the 100m Freestyle with Louis Bolton starting the day as he meant to go on with the first of 4 speeding tickets! As well as Murray Wakefield (the first of 6 Speeding tickets) and Sam White (first of 3 speeding Tickets). In Heat 4 Ben Mould and George Pearson lined up together in lanes 4 and 5 in what was a great race, both finishing within 1 second of each other and both knocking 6 seconds off their PB’s (great racing boys)! As the day progressed the team continued to add medals to the tally. It was great to see lots of enthusiasm, great team spirit and smiles all through the day. We were particularly impressed with the younger members of the squad who were keen as mustard all day, often asking to go up for their race 40 minutes early! The entire squad were very well behaved and were a pleasure to manage! Group 1 turned out in force seeing first time galas for Freya Fox and Jack Norman (special thank you to Theo Cross for helping Jack with the logistics). 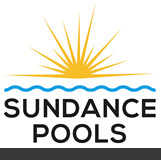 There were notable swims from Jack Allman, Martha Block, Sacha Livingstone and Joseph Enticott. 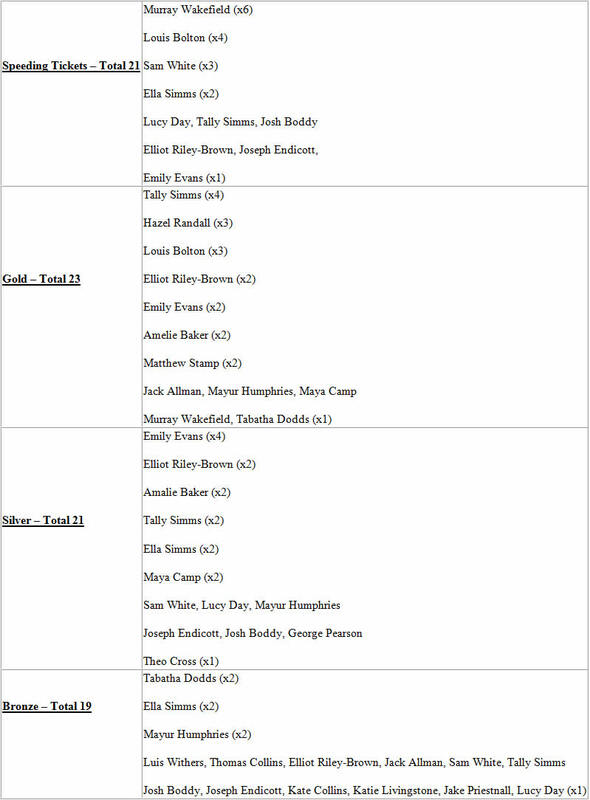 Many of group 1 swimmers had NT (no times) for their swims so it was really great that they entered so many races! Our Group 1’s saw lots of PB’s and great attention to detail with very few disqualifications. It was great to see and we look forward to welcoming along more Group 1’s to galas this summer. My race of the day saw Matthew Stamp and Sam White step up for the final heat in the Boys 100m IM. The lead changed places a couple of times throughout, with the boys finishing within 0.14 of a second of each other. Matthew picking up a gold medal, and Sam a speeding ticket. It was also great to see Louis Withers getting stuck in to some races too, only taking one breath in the first 25m of his 50m Free (breathing is over rated suggested coach Mark Simms)! With so many great swims and PB’s it’s a massive well done to everyone. Please look out for the official results which should be available in the next couple of days. This is the medal table as we made it, hopefully we managed to capture all of them! We seemed to also be competitive as the top club, but will have to wait for the official results for that one, fingers crossed! 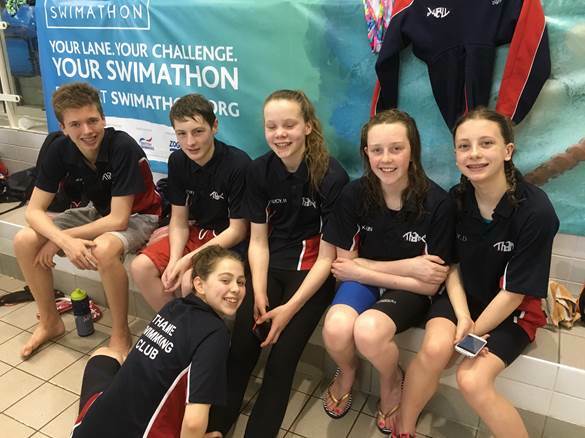 A squad of some 40 fantastic Thame Swimming Club swimmers took part in the Wycombe District Swim Club Long Course Sprint Meet on Saturday 22nd April and wow each and every person swam brilliantly. So many personal bests were achieved, with really strong swimming and a fabulous team spirit all in evidence. Thank you to Ian Blyth and Mark Simms for coaching the swimmers and to Melissa Simms for Team Managing. Thanks also to Paul Williams, Rachel Humphreys, Wendy Randall , Emma Camp and Sue Hewett for officiating too. 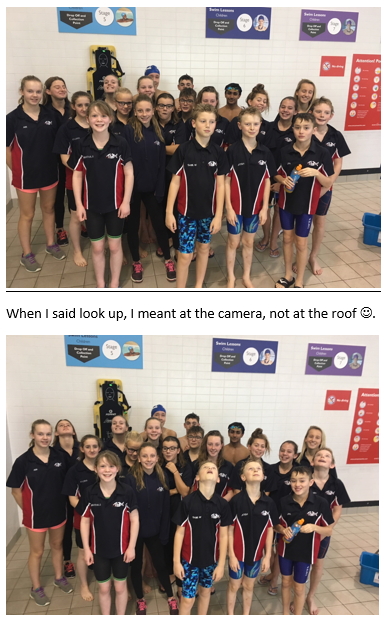 There was a really lovely atmosphere across the whole of the gala with smiles and ‘banter’ a plenty which was a fitting way for Josh Williams to swim his last gala for Thame Swimming Club. 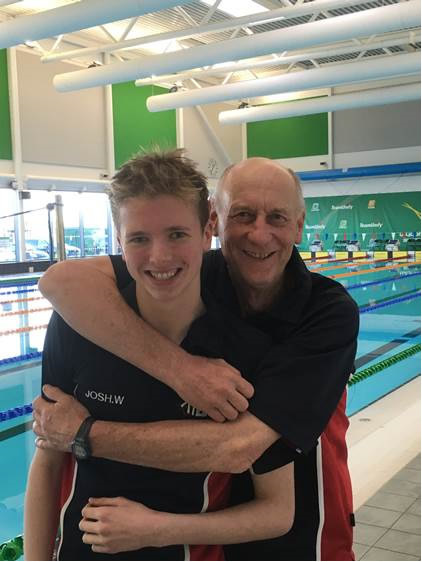 Josh is currently transitioning to Wycombe District Swimming Club but he wants to say a massive thank you to Ian Blyth and to all those who have coached him for their dedication, encouragement and belief in him, helping him to become the swimmer he is today. Ellison Socrates and Olivia Kidgell: first ever gala for Thame (and long course at that too)! Martha Block, Tally Simms, Josh Williams, Marcus Birmingham, Rory Pridmore, Katelin Phillips, Thomas Collins, Ashbeigh Socrates, Sam White, George Nelson, Henry Bell, Josh Boddy, Maya Camp and George Pearson: breaking significant time barriers! George Pearson: for taking a massive 10 seconds off his 100 Breaststroke time. Murray Wakefield: for taking a whopping 18 seconds off his 100 Backstroke time. Oliver Humphreys: for taking a huge 7 seconds of his 50 Back time. Sacha Livingstone: for taking an enormous 12 seconds off her 100 Backstroke time. 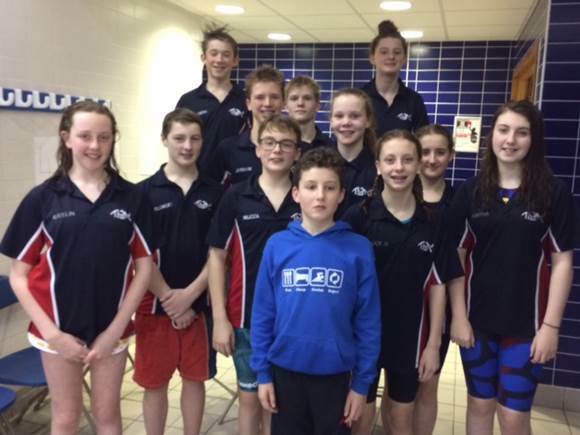 A squad of some 20 swimmers ventured to Watford for the annual Regional Qualifier meet over the weekend of 18th/19th March 2017. Those swimming on the Saturday were lucky enough to enjoy a lie-in as the meet didn’t start until 1pm so the swimmers were lively and raring to go once the event got underway. Sadly this wasn’t the case for those swimming on Sunday with another more usual early start! Team Thame enjoyed a great weekend of racing against a very competitive field from much larger clubs, with all our swimmers coming home with at least one PB and most with multiple PBs, which was a fantastic result! An awesome opening swim for Murray Wakefield, knocking 14 secs of his 400 Free, having only just set his ‘old’ PB at Counties in February! Josh Williams went a fantastic sub 2 minutes for the first time in his 200 Free, which ranks him top of the South East Region and 13th in the whole of Great Britain in this distance for his age group. Wow – what a phenomenal achievement; well done Josh! Josh also takes the top place in the SE Region for his 400m Free PB of 4.15.74. Joshua Greig powered to a PB of 29.56 in his 50 Free, his first sub-30 second time at this event – fabulous! Oscar North picked up four Regional Consideration Times for 400 Free, 50 Fly and 200 Free and 100 Free – great work Oscar. Katelin Phillips for an outstanding 400 Free swim, knocking a whopping 25 seconds off her previous PB, way to go! Katelin also went sub 40 for the first time on her 50 Fly with a time of 38.81. Maya Camp for fabulously swimming sub 3 minutes for the first time in her 200 Backstroke (2.54.21) – awesome swimming Maya. Our Club was congratulated by some of the Watford Marshals for having such a lovely, polite and punctual squad of swimmers – so thank you to you all for being so fabulous! Thanks to Paul Williams, Emma Camp, Rachel Humphreys and Emma Day for officiating and to our ever supportive coaches Ian Blyth and Iain Phillips for all their encouragement. It was a rare outing for Michele Block as Team Manager (usually officiating! ), helped by our new recruit, Damian Wakefield – we had a great time – thanks to all the swimmers there who threw themselves into cheering and supporting each other – what a Team! 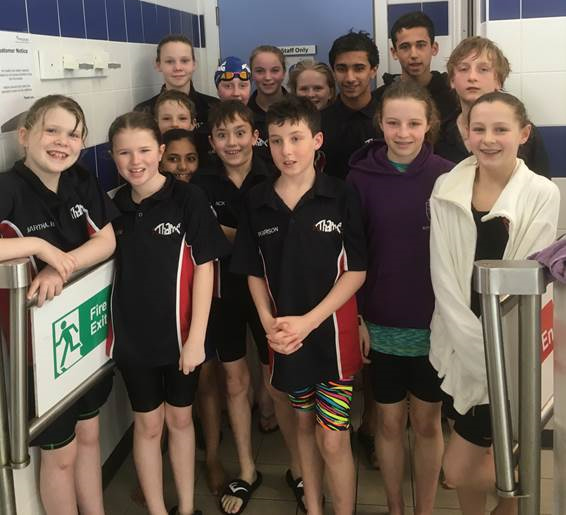 As the sunshine filled Bletchley Leisure Centre, a squad of 23 Thame swimmers took to the water to compete in the annual CMKSC Spring Open Meet. Under the guidance of Head Coach Ian Blyth and Coach Iain Phillips all the swimmers rose to the occasion and put in some fantastic performances. It was so rewarding to see the smiles so wide and the genuine happiness of the swimmers after their races. Great camaraderie was in evidence too with lots of cheering by all the team. Thank you to our wonderful officials: Rachel Humphreys, Rachel Mould, Michele Block and Phil Evans – and to Helen Birmingham for Team Managing for the very first time (and doing it brilliantly)! Martha Block for knocking an amazing 12 seconds off her 100 IM time and to Louise Birmingham for swimming under 2 minutes for the first time in the same event. Mayur Humphreys also took a whopping 16 seconds off his 100 IM personal best time too. George Pearson for his amazing 18 second PB in the 200 Fly event – fabulous! Oliver Humphreys and Jack Allman for both swimming under 40 seconds for the first time in their 50 Freestyle, way to go boys! Further Jack Allman also swam under a minute for the first time in his 50 Breaststroke. All of the following swimmers who swam events for the very first time: Thomas Collins (100 Breaststroke, 100 IM); Isabella Johnston (50 Fly); Ben Mould (400 Free); Katelin Phillips (400 IM); Jack Allman (100 IM, 100 Breaststroke); Oliver Humphreys (100 Breaststroke); Martha Block (200 Free); Heather Sluka (200 Free) and Louise Birmingham (100 Breaststroke). 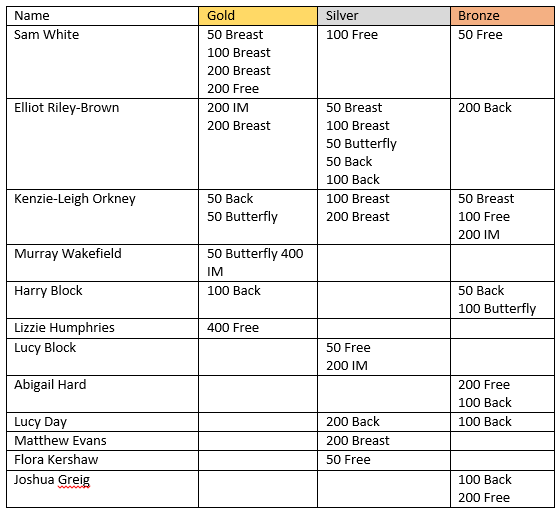 The swimmers also amassed a fabulous medal tally, detailed below. Well done to all those swimmers winning medals today. 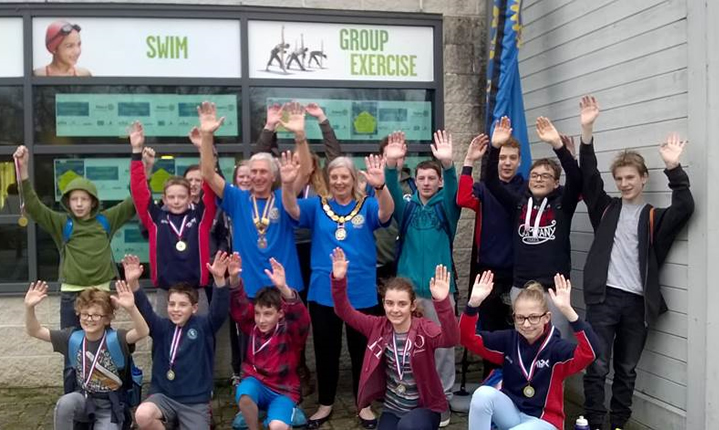 Huge congratulations to all the Thame Swimming Club swimmers who took part in the annual Thame Rotary Swimathon today. We had a record number of 9 teams taking part, across all the Groups and we had a parents team too – so well done to all! Special call out to Ben, Marcus, James, Rory & Josh who smashed the previous Rotary record of c185 lengths with an amazing 221 lengths in the hour! Whilst the sponsorship monies are still being collected and counted, early indications show that we have raised in excess of £1600 in total, with half of that coming to the Club so a fantastic result all round! It is with sadness that we say goodbye to two of our long-standing swimmers – James Newton and William Simpkins – both of whom have played a major part in making Thame Swimming Club the fabulous club it is. You will both very much be missed but good luck with your future studies and we hope you keep up with your swimming in some form or other. James will still be around in a coaching capacity. Thank you to Linda Newton for once again orchestrating the entries and the teams – fabulous as ever. A fantastic squad of some 21 swimmers across all the groups from Thame Swimming Club attended the Wycombe District BC Long Course Meet over the weekend of Saturday 18th and Sunday 19th February 2017, under the guidance of coaches Mark Simms and Iain Phillips on the Saturday and Ian Blyth and Simon Haarburger on the Sunday. For some swimmers it was their first ever gala and for some it was their first time swimming long course. 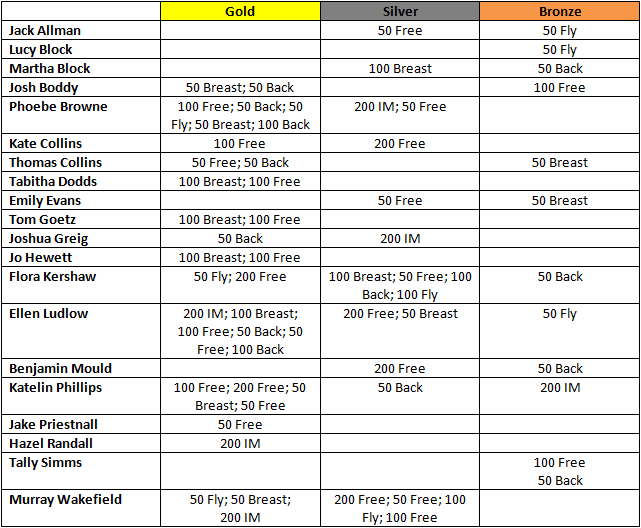 The swimmers were all on fire with an abundance of PBs and medals in evidence! A very big well done to all. Very excitingly we achieved the status of Top Visiting Club for the Girls (out of 14 other Clubs) and we were 3rd for the boys. The Girls won 254 points across the weekend, outperforming Windsor who came in 2nd place with 205 points. Way to go girls! Jack Allman for winning medals in his first ever gala for Thame – and a 50m pool too. Excellent swimming Jack! Thomas Collins for swimming under a minute in his 50 Breaststroke and winning a Gold medal in his 50m Free despite his goggles snapping before the race and swimming it goggle less. What a great spirit Thomas! Ben Mould for taking a massive 12 seconds off his entry time for his 200 Free. Fabulous Ben! Martha Block for taking an amazing 24 seconds off her 100 Breaststroke and winning the Silver medal – brilliant Martha! Katelin Phillips, Kate Collins and Flora Kershaw for taking over 20 seconds off their 200 Free time. Tally Simms for taking a huge 15 seconds off her 200 IM time – whoop! I would also like to take this opportunity to say huge congratulations to Tom Goetz for winning two Gold medals in his last ever gala for Thame. I would also like to take this opportunity to thank Tom for his commitment to the Club, being one of the original swimmers when the Club first evolved. We wish you well in your future studies Tom. Thank you to Melissa Simms and Marcus Birmingham for Team Managing and to those parents who gave up their time to officiate, as ever it’s hugely appreciated. The medal tally can be seen below – WOW! Outstanding Swimming at ONB County Championships 2017! 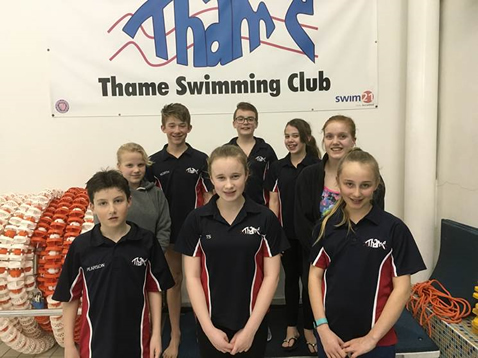 Truly inspiring swimming was in evidence across the whole of the ONB County Championships 2017 with Thame Swimming Club achieving its highest ever placing, coming 10th overall with 140.5 points. Further we had a 34% increase in the number of accepted race entries which is a fantastic accolade for both our swimmers and coaches alike – especially with the changes to the age groups implemented this year. Thank you to Head Coach Ian Blyth and the coaching squad of Simon Haarburger, Mark Simms and Lucy North who supported and coached the squad across the championship. They inspired the swimmers to reach for their goals resulting in County Champions, Regional Accepted and Consideration times, PBs and all round fantastic swimming being in evidence. Thank you also to all our wonderful officials, parent volunteers and team managers who gave up their time to also support our swimmers and the smooth running of the Championships overall. Without you, Thame wouldn’t be the fabulous Club it is. Thank you. Congratulations to Josh Williams who achieved a 17 second PB in his 1500m, taking the Open Club Record in a time of 17.22 minutes. Rory Pridmore achieved an 11 second PB in a time of 18.11 minutes. Elizabeth Humphreys and Ella Simms swam brilliantly in their 800m Free, kicking off Counties in style for the girls. The girls were on fire in their 400m IM with Lucy Block, Lucy Day and Ella Simms all achieving big PBs. Well done to Elizabeth Humphreys for winning a finalist plaque in the 400 Free and to Lucy Block, Lucy Day, Hazel Randall and Tally Simms for their fab PBs too. In the 400m Free for the boys both Ben and Josh Williams won finalist plaques with Josh being the 2nd fastest in the County for 15 year old boys J. Well done to Rory Pridmore, Marcus Birmingham and Murray Wakefield for their awesome PBs too. 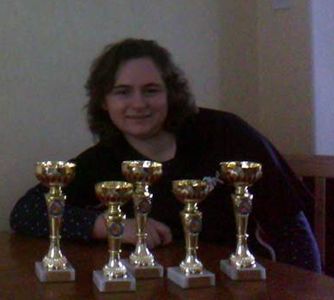 Jo Hewett: 3 x Gold Trophies (100 Free, 50 Free, 100 Back) and 2 x Silver Trophies (200 Free, 50 Back) within the multi-disability category and some great PBs along the way too. Fantastic Jo, we’re so proud of you. Josh Williams: 5 x County Champion (200 Free, 100 Free, 50 Back, 200 Back, 50 Fly) … amazing swimming Josh and what a fabulous way to end your time at Oxon & North Bucks! Lucy Block: achieving Regional Accepted Times for her 50 Back, 100 Back and 200 Back … brilliant! The Sumo Wrestler, the Morph Man, the Random Florescent Man & the Random Hawaiian Man: for entering into the spirit of things and smashing the Relay record! 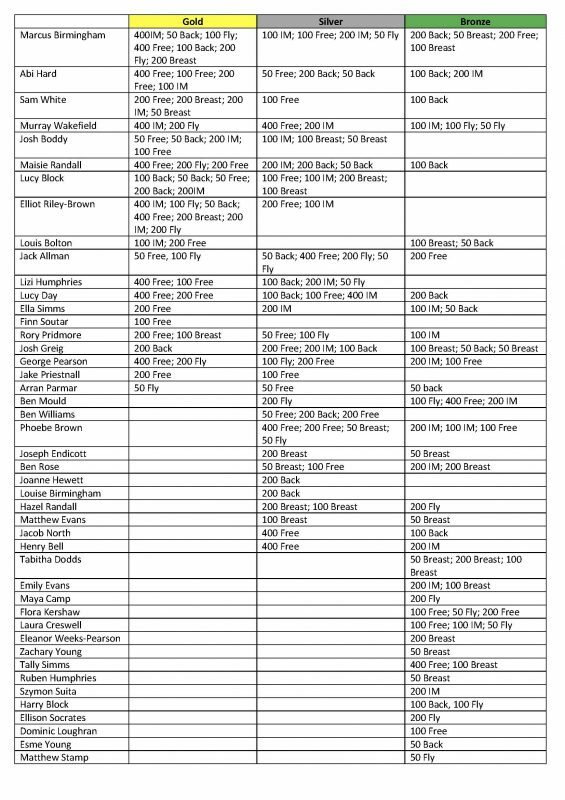 It is with some sadness that I write this as it will be my last Counties report for Thame Swimming Club but wow I’m also writing it feeling so proud of each and every swimmer. It’s been an absolute pleasure to Team Manage the squad and be there for them whether they be happy or sad. There really is nothing quite like the feeling when you see a swimmer achieve a goal or a dream and the absolute sense of euphoria that comes with it. So a heartfelt thank you and huge congratulations to every one of you. You gave it your all and we can’t ask for more than that! Below is a picture of some of our swimmers from ONB Counties – apologies to those who were unable to attend the photo shoot this evening. 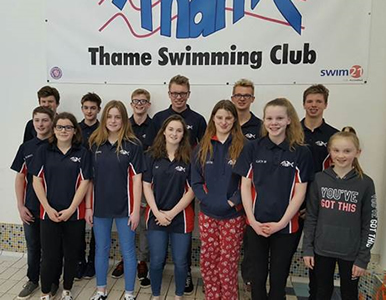 Saturday 28th January saw a fabulous 170 people come together to celebrate Thame Swimming Club swimmers success and achievements over the previous year. WOW, what a fantastic night it was too. It was held at Lord Williams’s Lower School which again seemed to be the perfect location to host our annual event. The food was delicious and plentiful and the atmosphere was buzzing! This year our Guest of Honour was the Mayor of Thame, Linda Emery who opened our evening and presented awards too. A really special touch to add to the evening. Thank you to all those who helped to make the event such a success including the Committee, parents who helped on the night either with car parking or on the bar and all those parents who very kindly donated raffle prizes. A special thank you to our Chairman Phil Evans and Rachel Humphreys for orchestrating the evening overall, to Iain Phillips for his fabulous photography and to Simon Haarburger for doing such a fantastic job compering the evening! But the evening was about our amazing swimmers and it started with a review of the key highlights from 2016 covering local galas, open water events, Counties, Regionals and Nationals; charity events such the Swimathon and Santa Sleigh; fun events like the Aquathlon and Thame Town Carnival and another successful swim camp to Torremolinos. What a truly amazing year! We also raised £4,372 in terms of fundraising over the year so thank you to everyone who has supported our charity events. The coaches then presented the swimmers with their achievement plates from Club Champs – and a massive thank you to Emma and George Day for organising each and every plate, a huge complex job! The link through to the photos will be sent via a separate e-mail as soon as the photos are uploaded. Please contact Iain Phillips takeyourpicphotography@yahoo.co.uk if you would like a copy of any of these photos. Flowers, plates and thank you’s were then given to Karen Powell who is stepping down as Group 1 coach (but will remain as Group 1+); Sherri Cozier who is stepping down as Group 3 coach; Wendy Randall who has stepped down as Officials Secretary and Helen Williams who will be stepping down as Comms Manager and Team Manager from July 2017. Helen Birmingham presented the Tom Birmingham Skins awards, in memory of coach Tom Birmingham, to Elizabeth Humphreys and Ben Williams, congratulations again to you both. Team GB were then presented their awards and prizes by David, Caroline and George Finch, as winners of the Will Finch Breaststroke Canon Relay, in memory of Will Finch who passed away in 2015. Well done to Martha Block, Thomas Collins, Lucy Block, Dominic Loughran, Flora Kershaw, Josh Williams, Laura Creswell, Harry Block, Ellen Ludlow and Will Simpkins. This year there were also Silly Awards and these went to Toby Pridmore (Group 1); Mia Collinson (Group 2); Lauren Gibbs (Group 3) and Rory Pridmore (Group 4). UCare ‘Most Committed Award’: awarded to Louis Withers for continuing to swim with a smile despite challenging times. Rob Brooks ‘Most Improved Award’: awarded to Lucy Block with a 7.63% improvement, followed by Oscar North and Jacob North. Simon Burnett ‘Most Competitive Award’: awarded to Josh Williams, followed by Ben Williams and Elizabeth Humphreys. A fantastic evening celebrating so many achievement and lovely to chat and mingle away from the pool! Thank you to everyone who came and made the evening such fun and helped to raise £742 for the Club too! On Saturday 7th January Thame Swimming Club Group 2 swimmer, Benjamin Mould, was lucky enough to meet former GB Olympic swimmers Rebecca Adlington and Steve Parry at an AquaVale event. Benjamin got the chance to chat to them both and get autographs – together with seeing Olympic medals up close too.